Wrightsville Beach, N.C. – Thousands of triathletes from 43 states and 7 nations will enter the water in Wrightsville Beach to compete in the upcoming Wilmington YMCA Triathlon on September 21 and the PPD Beach2Battleship Full and Half Iron Distance Triathlon on October 26, 2013. These events will showcase over 3,200 triathletes from Brazil, Canada, Germany, Norway, Switzerland, the United Kingdom and almost every U.S. state. Triathlete magazine has named October’s PPD Beach2Battleship one of the Top 5 iron distance triathlons in the world. The fall triathlon season on the Carolina coast begins at Blockade Runner Beach Resort on Saturday, September 21 with the 16-mile Wilmington YMCA Triathlon. This U.S.A. Triathlon-sanctioned sprint distance event is the biggest race in the AAA Car Care North Carolina Triathlon Series and one of the largest single-distance, one-day events from northern Virginia to Florida. 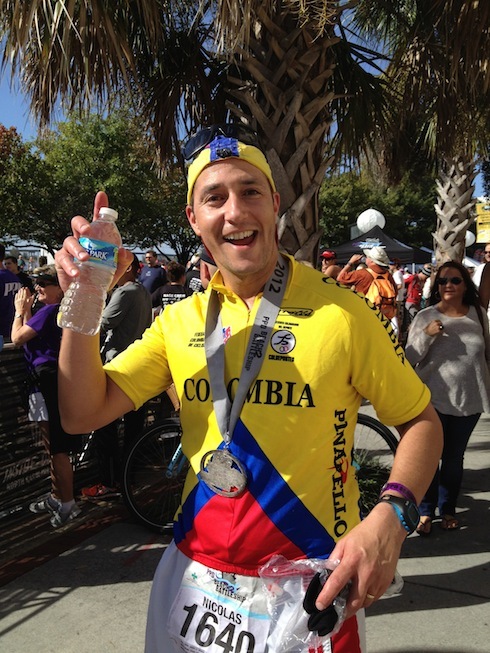 Montoya himself is a triathlete who will compete in his 10th triathlon this year. While Wrightsville Beach Park is the staging area for the Wilmington YMCA Triathlon, the race begins soundside at Blockade Runner with a 1,500-meter saltwater swim in Banks and Motts Channels. The swim, with an incoming tide, is followed by a 20k (12.5-mile) bike course over the drawbridge with a turn onto scenic Airlie Road, and a 5k (3.1-mile) run course including the landmark John Nesbitt Loop. A beach cruiser category is being introduced this year for casual participants and fans. Every athlete who enters this division will be given a free ticket to enter the post-race drawing to win a new beach cruiser bike. Click here for Wilmington YMCA Triathlon information and registration. At daybreak October 26, the PPD Beach2Battleship Iron Distance Triathlon enters the world spotlight. Both the Full and Half Iron Distance events are sold out, with the exception of 50 charity slots for the Full Iron Distance. Thousands of spectators will take in the triathlon along the 140.6-mile route. The action begins at the south end of Wrightsville Beach with a 2.4-mile (full), 1.2-mile (half) saltwater swim on an incoming tide. 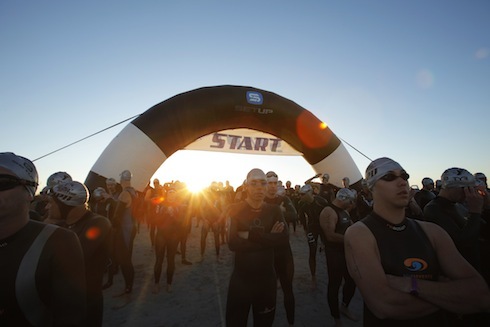 The water temperature is expected to be between 62 and 68 degrees making wetsuits and race-issued swim caps mandatory. Following the swim, 112-mile (full) and 56-mile (half) bike courses will take competitors from urban highways, along an interstate and rural routes. The bike course is flat except for the final stretch, a bridge crossing over the Cape Fear River toward Wilmington. The 26.2-mile and 13.1-mile run courses will wind through downtown Wilmington with loops around picturesque Greenfield Lake.